A whole new degree in dining. Located on the shore of the Mystic River, Latitude 41° Restaurant & Tavern welcomes you with an ambiance that captures a fresh essence of the maritime experience. Natural hues surround a unique combination of historical and contemporary elements including extraordinary photographs from the Rosenfeld Collection. Dine in one of the main dining rooms, gather with family and friends for casual fare in the classic Shipyard Tavern, warm yourself near one of the fireplaces, or sit back and enjoy cool river breezes while dining al fresco. Serving New American cuisine using the highest quality ingredients, Executive Chef Eric Veilleux practices a no-boundaries approach to flavors and techniques. We support local farmers and pride ourselves with a philosophy based on consistency, creativity, innovation, and inspiration. 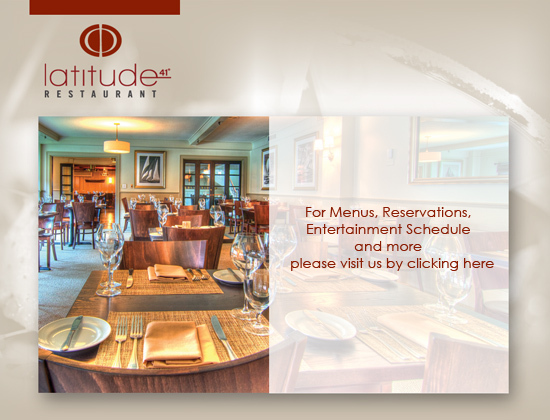 Latitude 41° offers something for everyone and is truly a destination dining experience. Your own numbered ceramic mug with the Shipyard Tavern logo and Latitude 41° logo. The mug is housed in our Members’ Only rack and will be ready and waiting for you each time you visit. 4 ounces of your favorite Shipyard Brew poured with our compliments when you purchase 16 ounces for your 20 ounce mug. A Shipyard Brewing Company t-shirt. $20 toward a birthday lunch during your birthday month between the hours of 11:30 am-5 pm. Half-priced appetizers from the Tavern Menu and 10% off all entrees, Wednesday through Friday from 4-6 pm (in the Tavern only). An invitation to special Members’ Only events. Guest memberships at other Shipyard Brew Pubs. Food, beverage, and catering services at Mystic Seaport Museum are provided by Coastal Gourmet Group, a company comprised of passionate individuals dedicated to offering the finest food and catering services. Coastal Gourmet’s talent and expertise creates a classic and tasteful experience that excites the senses. Friday & Saturday, 11:30 a.m.-10 p.m. Happy Hour Thursday & Friday 4-6 p.m.
Let us host your next event! Click here to fill in your event details or call our special event team at 860.572.5305. May 9. RESCHEDULED from November: Join us as Dwight Collins recounts his harrowing journey of over 2,000 miles across the Atlantic Ocean, a feat which earned him the world record for fastest human-powered crossing.